Since 2000, the Chinese Communist Party (CCP)’s official media and hospitals across China started to report an explosive increase in the number of transplantations. Such a phenomenon has generated many questions, with the organ source being the most frequent question asked. However, the CCP has been very tight-lipped about the organ sources. In 2006, when the CCP’s illicit organ procurement was exposed to the public, the CCP has been fabricating a series of lies to hide the real source of organs used in transplant operations. Since late 2005, the Vice Minister of Health, Huang Jiefu, has been issuing statements and publishing articles regarding China’s transplantation situation, while positioning himself as China’s transplant authority and official spokesperson. Due to the lack of official statistics and Chinese Party-state’s lack of transparency, Huang Jiefu had indeed become China’s spokesperson on transplantation issues. Therefore, it is necessary to analyze Huang’s statements and articles over the years in order to see through the CCP’s lies. This report includes Huang’s public statements reported by the CCP’s official media, overseas media, as well as Huang’s published articles. Analysis of these statements proves that the CCP has been using deceptive methods in an attempt to hide its crime of live organ harvesting from Falun Gong practitioners. In an article published in 2000, Huang Jiefu referred to China’s liver transplant as “initial attempts in 1970s, hesitant and stagnant in the 1980s, and restarting in 1990s.” According to Huang, in the 23 years period from 1977 to 1999, there were a total of 228 liver transplant operations performed . This puts the annual average number of liver transplants at fewer than 10. Since 2000, transplant operations suddenly became the “money cow” for hospitals of various sizes across China. Some profit driven hospitals would coerce patients into accepting transplants as the cure (while other remedies were possible) . Many transplant centers would advertise online, claiming they had “ample organs, excellent matching, and 1 to 2 weeks of waiting time.” These advertisements attracted domestic and foreign patients. WOIPFG has archived some webpages with such advertisements in 2006. Following are a few examples, through which one can get an idea of the scale of the transplant industry after 2000. According to the website of U.S. Department of Health & Human Services, the average waiting time for a liver transplant for patients aged 35 to 64 is over 400 days . Prior to 2006, China International Transplant Network Assistance Center (CITNAC) website operated in Chinese, English, Japanese and Russian. Its Chinese webpage titled “About the Donor” (figure 3) said, “The waiting time for a liver transplant is as short as one month, and no longer than 2 months. For a kidney with perfect HLA matching, the waiting time is as short as 1 week, and no longer than 1 month. If problems, such as fatty liver disease, were found after removing the liver from the chosen donor, the operation can be canceled. CITNAC promises to find another donor and schedule another operation within a week.” Without a large, live organ donor bank, where could such confidence come from? On Dec. 17, 2003, Shanghai Changzheng Hospital was designated by the People’s Liberation Army (PLA) General Logistics Department to be the PLA Organ Transplant Institute. From then to late 2005, it performed 3,081 kidney transplants and 460 liver transplants (figure 6). Figure 6: From 2003 to 2005, PLA Organ Transplant Institute in Shanghai performed 3,081 kidney transplants and 460 liver transplants. In May 2007, in two published articles, Huang Jiefu provided very different numbers of liver transplant performed in 2005. One article was originally published on the Ministry of Health website, in which Huang Jiefu told the media, “In 2005, there were 2,500 liver transplants performed .” The other article was published in the May 2007 edition of Chinese Journal of General Surgery. The article quoted Huang Jiefu saying that in 2005, there were 3,500 liver transplants performed . Exactly how many liver transplants were done in 2005? Huang himself does not know for sure. Therefore, we cannot place too much emphasis on the accuracy of the specific numbers. Yet, it’s worth noting that the liver transplant numbers have grown from fewer than 10 cases prior to 2000 to more than 3,000 cases (or more) in 2005. This kind of explosive growth in organ transplantation has never happened in any other country. Allegations of China’s using organs from executed prisoners have been abounded for a long time. The Chinese Party-state’s reaction changed from routine denial to voluntary admission. This change happened in 2006. On March 9 and March 17, 2006, two witnesses independently revealed state-sanctioned live organ harvesting from Falun Gong practitioners, who were held in underground camps. According to the witnesses, the practitioners were killed during the organ removal, and their bodies were burnt immediately afterwards. One underground camp was said to be located under the Liaoning Provincial Thrombosis Hospital of Integrated Chinese and Western Medicine in Sujiatun district, Shenyang city, Liaoning province. One witness said that approximately 6,000 Falun Gong practitioners were held in the underground camp in the northeastern province of Liaoning . The sudden exposure of this information caught communist leaders unprepared, and they remained silent for 20 days before coming up with a response. During a March 28, 2006 routine press briefing, Qin Gang, spokesman for the Ministry of Foreign Affairs, denied allegations of the existence of the Sujiatun underground camp. However, Qin Gang admitted that China was “using organs from executed prisoners for transplants,” although saying, the practice was “very isolated, and with the consent from the executed prisoners.” Additionally, Qin Gang invited foreign journalists to “go [to Sujiatun] and see whether there is an underground camp .” In response to Qin Gang’s invitation, foreign reporters and independent investigators applied for visas to enter China, but the applications were all denied. It is common knowledge that China has no voluntary organ donation system. But the spokespersons for the Ministry of Foreign Affairs and the Ministry of Health both insisted that the organs were donated. Obviously, they were told what to say by the CCP Central. The core issue of the Sujiatun exposure was that Falun Gong practitioners were being killed for their organs. The CCP has never addressed this core issue. Although Qin Gang, the spokesperson for the Ministry of Foreign Affairs invited foreign journalists to go to Sujiatun, the Chinese regime’s embassies and consulates rejected all visa applications from media personnel and independent investigators. On June 2, 2006, Canadian international human rights attorney, David Matas, and former Canadian Secretary of State, David Kilgour, sent a letter to the Chinese Embassy in Canada regarding their plans of an independent investigation inside China. They did not get any reply for 3 weeks. When they did meet with an Embassy employee 3 weeks later, their requests were simply ignored . Coalition to Investigate the Persecution of Falun Gong (CIPFG) member, Xu Lin, a Sound of Hope reporter, followed the normal visa application procedure to apply for a Chinese visa on April 19, 2006. The application was rejected by a council at the Chinese Consulate in Sydney, Australia . As Vice Minister of Health, and a transplant surgeon, Huang Jiefu knew very well that China would have to explain, sooner or later, the question of organ procurement. But the Sujiatun exposure happened suddenly, leaving the CCP Central unprepared. It seems that while trying to destroy the evidence, the CCP Central made the spokespersons from the Ministry of Health and the Ministry of Foreign Affairs contradict Huang Jiefu’s earlier statement. In July 2006, David Matas and David Kilgour released their investigation results, confirming the allegations of organ harvesting from Falun Gong practitioners in China . The report generated much attention in the international community. Under such pressure, Chinese authorities started to voluntarily admit that China was the only country where organs from executed prisoners were systematically removed. The regime has been clinging to this statement since September 2006. On Nov. 14, 2006, Huang Jiefu indirectly admitted that the majority of the organs for transplantation came from executed prisoners. Huang said at a transplant conference in China, “The majority of organs for transplant were from donated corpses, part of which came from traffic accident victims and families [17, 18].” In China, organs from executed prisoners have all been categorized as “donated after death.” Huang’s statement implied that the majority of organs used for transplant are from executed prisoners. On Feb. 8, 2012, then Chongqing Mayor and Public Security Bureau Chief, Wang Lijun, escaped to the U.S. Consulate in Chengdu, Sichuan province, seeking political asylum . According to investigations by WOIPFG, Wang was involved in the live organ harvesting from Falun Gong practitioners in Liaoning province . The defection incident is said to have generated much fear among top CCP cadres. The CCP once again used Huang Jiefu to send another message about establishing an organ donation system. One and a half months after the Wang Lijun incident, on March 22, 2012, Huang Jiefu said in Hangzhou city that China will establish an organ donation program and promised to end the reliance on executed prisoners’ organs in 3 to 5 years [23, . However, the much hyped organ donation program recorded only “207 donations, or a total of 546 organs” across China in its first 2 years of existence from March 2010 to March 2012 . It must have been obvious to Huang Jiefu that, with an average of 273 organs donated per year, the organ donation system was not able to provide 10,000 organs per year in 3 to 5 years’ time. 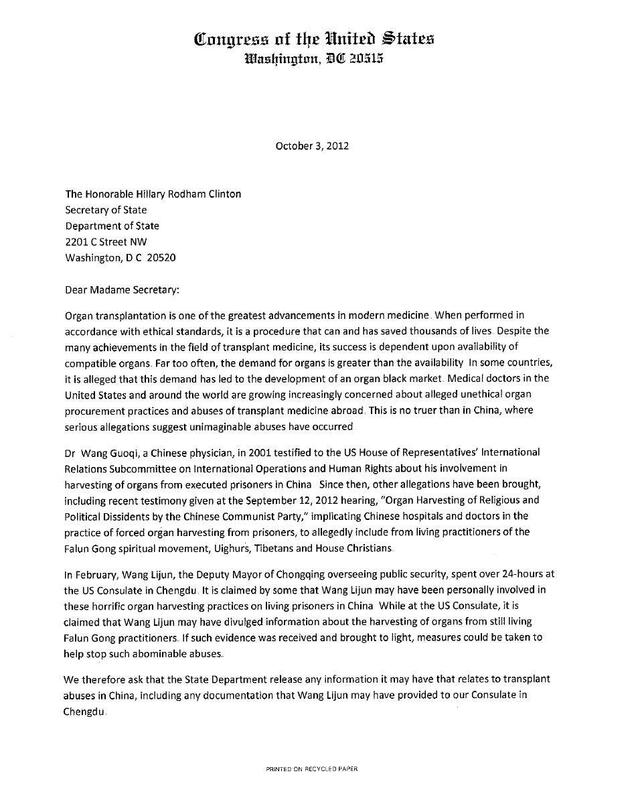 On Oct. 3, 2012, 106 U.S. Congress members signed a Dear Colleague Letter to Secretary of State Hillary Clinton, expressing their concern about the forced organ harvesting in China, and requesting the State Department to release any information it might have on this very important matter . Under this pressure, Chinese authorities felt they had to shorten the time frame in which they promised to end the use of executed prisoners’ organs from “3 to 5 years” to “1 to 2 years.” On Nov. 21, 2012, Huang Jiefu said that the organ donation system had recorded “465 donations, or a total of 1,279 organs” between March 2010 and Sept. 2012 . Table 1 is the comparison of the two sets of data provided by Huang Jiefu. According to data provided by Huang Jiefu, in the 6 months’ period from March to September 2012, there were 260 donations, or 723 organs recorded by the system. Comparing to the 2 years leading to the 6 months’ period, the average monthly donation numbers increased from 8.625 to 43.3, and the average monthly number of donated organs increased from 45.5 to 120.5. It is not plausible that the same system in the same environment can generate such a huge jump. In order to obscure the issue of the real source of the majority of organs used in China, Huang Jiefu provided questionable data regarding the newly established organ donation system, and issued statements about the “donations” being the source of organs for transplant. Huang Jiefu has been saying that 10,000 transplants are performed each year in China. Knowing that the number of donated organs is very low, yet Huang Jiefu promised to end the use of executed prisoners’ organs. This implies that there is a huge live organ donor bank in China, and those “donors” are not death row prisoners, and they are not voluntary donors either. In order to hide the real source of organs, Huang Jiefu announced the shortened time frame for stopping the usage of executed prisoners’ organs. The CCP spared almost no regulatory efforts to control the rapid increase of transplant numbers. On Sept. 7, 2004, Huang Jiefu said at a transplant meeting held in Shenyang city, “China’s transplant operations are competitive, chaotic and without rules.” Huang mentioned the implementation of certain “transplantation permit requirement” for hospitals. The so-called “permit requirement” had no requirements on organ procurement, and only focused on doctor training and hospital equipment . This situation continued until 2006, although Huang made many statements about the “permit requirement” during that time frame. The Chinese regime was accused of illicit organ removal in March 2006. It denied the allegations via its Ministry of Foreign Affairs and Ministry of Health. In the meantime, it issued statements about implementing “regulations” and setting up “committees” in an attempt to paint a proactively reforming image. The CCP’s practice of taking organs from living Falun Gong practitioners was exposed on March 9, 2006. 18 days later (March 27, 2006), the Ministry of Health issued a statement saying, the “Temporary Provisions on Administration of Clinical Application of Human Transplant Techniques” would be implemented in July 1 . In July 2006, the Ministry of Health set up the Organ Transplant Committee (OTC) to draft the organ transplant regulations. Huang Jiefu, then Vice Minister of Health, was named chairman of OTC . In May 2007, the Ministry of Health issued the “Human Organ Transplant Regulations” but did not specify any monitoring and enforcing entities. A year later, in April 2008, OTC became the monitoring and enforcing entity . In Sept. 2010, China Organ Donation Committee (CODC) was established to draft the policies on organ donation. Huang Jiefu was again named chairman of CODC . It is worth noting that the organ donation program started 6 months prior to CODC’s establishment. This shows the chaotic state of the much hyped organ donation program. On March 1, 2014, authorities decided to combine the two existing committees, OTC and CODC into “China Organ Donation and Transplant Committee.” Huang Jiefu was the chairman of both committees and remained chairman of the new committee . The online advertisements were mostly from top-rated civilian and military hospitals. They could put up bold advertisements because they had easy access and control over the large bank of organs. Although the advertisements were removed, the transplants did not stop. Additionally, for sake of information control, transplant operations involving foreign patients were prohibited since July 2007 . Huang Jiefu has always been saying that executed prisoners’ organs were the main source for the increasing organ transplants year after year. If this statement was true, the number of executions should have been increasing. Huang Jiefu’s statement of decreasing number of executed prisoners started in 2013. The purpose is to set the stage of organ shortage for the introduction of organ donation program and regulations. In May 2013, Huang came under fire about his honorary professorship from the University of Sydney. Huang told the media, ” written consent from the prisoner himself or herself as well as his or her family [is needed]." Huang, a transplant surgeon himself, added that his own practice has not taken any organs from the prisons for two years. Additionally, Huang did not forget to promote the policy of organ donation. “From the progress we have made, I estimate within two years we will completely eliminate the heavy reliance on prisoners' organs ,” he said. The policy of organ donation seeks to change the thousand years old tradition in China of maintaining a complete body at death. No policy can have the instant effect of making people forget this tradition. In 2012 and 2013, Huang frequently used “one to two years” as the timeframe to end using executed prisoners’ organs. Three such statements are listed in table 2. Huang Jiefu is a practicing surgeon and in charge of China’s transplantation committees. He is also the main promoter of the organ donation program. Most information about China’s transplantation was obtained from Huang. Why did Huang say he did not know how many executed prisoners’ organs were used? This statement contradicted Huang’s own article published in Lancet in 2011. However, one month later, Huang came up with a percentage. Huang Jiefu’s statements about organ transplantation in China are far greater in number than the few listed in this report. However, the examples show that the policy and regulations were merely window dressing, and are not worthy of any attention. What needs to be continually probed is the issue of organ sources since 2000. In section II, we analyzed the inconsistency of monthly average donation numbers provided by Huang Jiefu. In this section, we will focus on how the Chinese regime distracts the attention by using the donation program and the organ black market. Once again, the international community should be looking for answers to where the organs came from around 2006 when organ transplant numbers peaked in China and when the allegations about forced live organ harvesting from Falun Gong practitioners appeared. Neither the donation program, nor the black market, which both appeared around 2010, can answer this critical question. Around 2010, the Chinese media started to report on the organ black market. Many transplant hospitals that conducted large numbers of transplant operations during the period from 2000 to 2008, were forced to stop because they did not meet the requirements. The remaining hospitals, including some military hospitals, were involved in the organ black market trade. In September 2012, Caijing Magazine reported on a case of fifty-one kidneys being sold through the black market to the PLA 304 Hospital, which had “trouble meeting the minimum requirement of transplant numbers” since 2009 . This case shows that prior to 2009, hospitals did not have to go to the black market to obtain organs. Especially prior to 2006, there was no need for black market organs, instead, there seemed to have been an abundance of organs, resulting in hospitals advertising organ transplants online. In 2013, a few organ black markets were heavily reported by state-run medias Xinhua and CCTV . The existence of the organ black market is a fact. But the volume of the black market is far smaller than the total transplantation volume. Moreover, only kidneys can be obtained on the black market, since a person has two kidneys. The reason the CCP’s media heavily reported on the black market was to mislead the public into thinking the black market was rampant, involving lots of organs. But that is not the case. On March 1, 2014, Huang Jiefu announced the combination of two committees he was in charge of, OTC and CDOC, into one committee. Huang also revealed the fact that forcibly removing executed prisoners’ organs has been done systematically. Back in May 2013 when Huang was under fire about his honorary professorship at the University of Sydney, Australia, he said, "Consent is not presumed consent--written consent from the prisoner himself or herself as well as his or her family [is needed]." Huang Jiefu has been the person in charge of committees for at least 7 years. How did the combined committee become Huang’s “main task?” What has Huang Jiefu been doing over the past 7 years? Huang Jiefu, born in 1946, is a liver transplant surgeon. From January 1996 to October 2001, Huang was the director of Zhongshan Medical University. From December 1997 to October 2001, he was also the Party chief of the school . From October 2001 to March 12, 2013, Huang was the Vice Minister of Health . In July 2006, Huang was named the chairman of OTC . In 2008, Huang became the liver surgery department head at Beijing’s Xiehe Hospital , and chairman of CODC . On March 1, 2014, OTC and CODC combined, with Huang remaining chairman . On Sept. 18, 2003, Huang Jiefu attended a meeting at Zhongnan University Xiangya Hospital. On that day, seven kidney transplants were performed. Huang Jiefu conducted a liver transplant. The recipient was a 53 year old liver cancer patient. The report stated that the patient’s first visit to the hospital was one week prior to the operation . This confirms that the waiting time for the liver transplant was 1 week. In late 2012, while in Guangzhou city for meetings, Huang Jiefu conducted three liver transplants. One was on Nov. 21 at the No. 3 Hospital Affiliated to Zhongshan Medical University. One was on Nov. 22 at Guangzhou Military Region General Hospital. After the transplant was done, Huang said that there would be another one at Zhongshan Hospital on the next day . Organ donation and transplant operations are largely event driven. How did Huang Jiefu know, while traveling to another city, where, when and how many transplantations there will be? In March 2013, Huang talked about the above mentioned three operations to Guangzhou Daily: “Last year , I did over 500 transplant operations. The one done in Guangzhou in November was the first one donated by a citizen .” That is to say, out of the 500 transplants, the one in November was the first donated liver. Where did all the other livers come from? The Memorial Hospital and public clinics affiliated with the University all followed the lead and organized similar activities . In May 2001, Minghui.org (a Falun Gong run website to document the persecution), reported that the campus of Zhongshan Medical University, where Huang Jiefu was the director and Party chief, was filled with anti-Falun Gong slogans and banners . The unusual increase in transplantation numbers in China since 2000 implies that there is a large pool of live organ donors across China. The appearance of such a donor bank coincides with the CCP’s intensifying persecution of Falun Gong. Large numbers of detained Falun Gong practitioners became “organ donors.” An unknown, but very large number, of Falun Gong practitioners have been killed for their organs, resulting in the peak of China’s organ transplant numbers around 2005. 1) Admitting to the removal of executed prisoners’ organs without consent. However, the number of executed prisoners has decreased by 10 per cent every year since 2002, making it impossible to match the trend of increasing organ transplants since 2000. 2) Establishing an organ donation program. However, the highest number of donations was reported to be 1,570 cases in 2013. The program started in 2010. The donation numbers have been too small to cover the number of transplantation operations. 3) Organ black market. However, very small numbers of trafficked kidneys were uncovered on the black markets after live, state-sanctioned organ harvesting was exposed. This is merely another weak excuse by the regime to hide its crime of large-scale organ extraction from living Falun Gong practitioners for transplant purposes.